Fifty years ago today, which was also a Thursday, 46-year-old John Fitzgerald dressed in the White House for the eventful day that lay ahead in Texas. It was a time when men wore tie pins, and President Kennedy anchored his tie that day with a PT-109 boat clip. Clipped to his wallet was a gold medal with the likeness of Saint Christopher, the patron saint of travelers. At 9:15 a.m., the president said goodbye to his daughter, Caroline, who had to leave for school, before heading over to the West Wing and a last-minute meeting with speechwriter Ted Sorenson. It was a week of birthdays in the Kennedy family. The president’s brother, Robert, who was U.S. attorney general, had turned 38 the day before. Caroline would turn 6 a week later. John Jr., would turn 3 two days before his sister, on November 25. Because he wasn’t in school yet, the president let John ride to Andrews Air Force Base on Marine One, seated between his mother and father. When it came time to board Air Force One, John begged to go along. Told he couldn’t, the little boy burst into tears. Secret Service Agent Bob Foster attempted to comfort John, who didn’t really calm down until he watched the Boeing 707 lift off. The kid just loved airplanes, and as he watched it slice through the clouds he let out an audible sigh. The afternoon paper in the Texas city where President Kennedy landed on Nov. 21, 1963, faced a dilemma: The San Antonio Light would go to press before the president arrived, but it would be received by subscribers hours after the president had toured the city. So the editors made an educated guess based on what they knew of their city—and the affections of the residents—in what Democratic congressman Henry B. Gonzalez, flying into his hometown aboard Air Force One, described to the president as “Viva" Country. The paper knew its readership. The crowds along the motorcade route were indeed wildly enthusiastic, and large, too. The first stop was Brooks Air Force Base, where Kennedy dedicated a new aerospace medical center. He opened his speech there by claiming, improbably, that “the New Frontier” was not a partisan term. Previously in his presidency, John Fitzgerald Kennedy had used eloquent and aspirational prose to galvanize his countrymen behind the space race. On this day, the last full day of his life, he would do so again. But first, he asserted that exploring the heavens had practical applications, too. Kennedy didn’t speak for long in San Antonio. He had two speeches left to give that day, both of them in Houston, and fence-mending within the fractious Texas Democratic Party was still the main priority of this trip. The first hours of the journey had proven one thing, though: Gov. 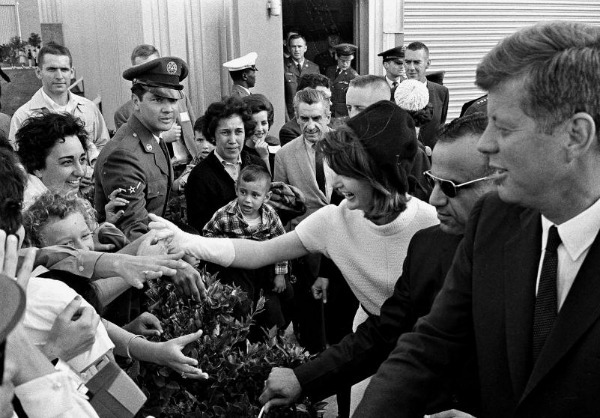 John Connally, one of the feuding protagonists in Texas’ power struggle, had been right about Jackie Kennedy’s immense popularity in the Lone Star state. The first couple were staying at Houston’s Rice Hotel, which was also hosting a meeting of the League of United Latin American Citizens. JFK spoke to the group briefly, followed by Jackie, who addressed them in Spanish. The first lady was nervous about her performance, and while she rehearsed her talk in one room in their suite, JFK summoned Vice President Lyndon Johnson to an adjoining room. There the men spoke, not altogether amicably, about the rift in Texas politics. Voices were raised. Afterward, the president downplayed the exchange to his wife. “That’s just Lyndon,” he said. Jackie professed her disapproval of John Connally and trepidations about her speech. Jack Kennedy soothed her feelings. He told her she shouldn’t let Connally’s imperiousness bother her and that she’d wow 'em at the LULAC event. They were there only 17 minutes; on this very long day, there was one last speech to give and three more motorcades. The first took them to the Houston Coliseum where Kennedy spoke at a tribute to local congressman Albert Thomas. They left that dinner after 9:30 p.m., making their way to the Houston airport en route to Carswell Air Force Base outside Fort Worth, landing at 11:07 p.m. The final motorcade of the day took them to the Hotel Texas. But before turning in, the young first lady found the energy to lay out her next day’s outfit: navy blue blouse and navy handbag, low-heeled shoes, and a classy pink suit with matching pillbox hat.